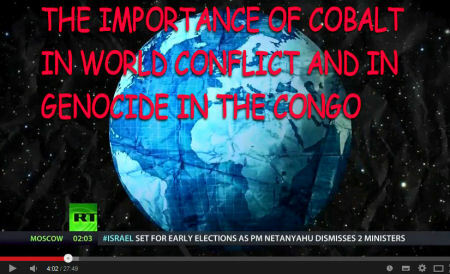 The world does not realise the importance of the Congo's cobalt reserves in the political misery there and the human rights abuses. Because of this it does not realise the role that foreign investment in mining cobalt plays in the dispossession, disorganisation, and death of people in the Congo and in the maintenance and support of dictatorships. People in the population movement often ascribe poverty, misery and dispossession to overpopulation, especially when the poverty is obvious, as in Africa. What they often fail to realise is that it was not always so. My books in the Demography, Territory, Law series explore this. And here is another article - about Ethiopia's population history, Development caused overpopulation in Ethiopia that sumarises some of the arguments against what we are usually told is so. Congo's overpopulation has coincided with its 'development' and industrial exploitation. Today Australia imports many educated professionals from the Congo - in a way that can only weaken its social structure further. Australian billionaire, Gina Rhinehart has suggested that Australians are uncompetitive, comparing them with Africans who work for terrible wages: " ... Africans want to work and its workers are willing to work for less than two dollars a day." (Source: http://en.wikipedia.org/wiki/Gina_Rinehart This is what invasion, 'development' and 'industrialisation' do to a country and they do it on purpose because it creates a situation of abject wage slavery. A variation on this was to simply marginalise the original indigenous populations if they were sparse or small-scale, then import slaves, prisoners or immigrant labour - as in Haiti, Costa Rica, Australia, and many other Pacific islands. In the late 19th century, when European 'development' began, the population of Congo was estimated at less than 4 million. Under King Leopold of Belgium the population was grossly disorganised and dispossessed by genocide and other violence. In 1950 the total population of Congo was estimated at 12,184,000. This was already a huge increase over the population it had had when its was structured according to tribes. By 2010 the population was 65,966,000. In 1876, Leopold II of Belgium formed the philanthropic organisation “Association Internationale Africaine“ (International African Association) and became its single shareholder. Typically, Leopold's industrial take-over was spearheaded initially by missionaries, who prepared the way. "Leopold's rule over the Congo involved a complex interlocking of private enterprise and state power. In the first place, his operations were carried out in the name of the International Association of the Congo. This Association, independent of Belgium or any other state but completely under Leopold's private control, proceeded to set up a sovereign state in the Congo, with Leopold as king and its own army, the Force Publique. Later on, the Congo State would lease out large tracts of its territory to private companies, which exercised virtual state power in their own zones. My books, Demography, Territory, Law: The Rules of animal and human population, Countershock Press 2013 and Demography, Territory, Law2: Land-tenure and the origins of capitalism in Britain, Countershock Press 2014, explore this fallacy generally, but it is not hard to work out for yourself that there is something wrong with the assumption that Africa, India, China and overpopulated islands in the Pacific, could not always have been like that.